Phthalates have pervaded the toy market without raising much alarm. China that has cornered 70 per cent of the global toy market does not regulate their use. International standards dealing with toy safety ignore them. While EU took the lead in imposing limits for phthalates in toys, the US has only recently passed the law regulating phthalates. EU was the first to regulate the use of phthalates in toys. In 1999, it temporarily banned six phthalates used in childcare articles and toys made of soft pvc that can be put in the mouth by children under three. In 2005, it decided to restrict the use of three phthalates— dehp, dbp and bbp— in all childcare articles and toys to 0.1 per cent concentrations by mass of the plasticized material. Toys containing these chemicals in higher quantities cannot be sold in EU countries. The EU proposed the same limit for three more phthalates— dinp, didp and dnop ( di-n-octyl phthalate) —but only in toys and childcare articles meant to be put in the mouth by children. Other toys were exempted from this restriction for want of more evidence of the toxicity of the three phthalates. The EU, however, noted that the three pose a potential risk if used in toys. The restrictions came into force from January 16, 2007 and shall be reviewed by January 16, 2010. The EU is now considering evidence that shows phthalates acting together harm health in ways each by itself would not. Denmark has gone a step ahead and placed a ban on the sale and import of toys and childcare articles meant to be put in the mouth that contain phthalates, not covered by EU regulations, at levels exceeding 0.05 per cent. To ensure that toys available in the country are phthalate-free, the Danish government has also negotiated an agreement with retailers to voluntarily refrain from selling phthalate-containing toys (like musical instruments) meant to be put in the mouth by children between three and six years. Denmark taxes pvc —plastic used in toys—and phthalate-containing products, domestic and imported. EU regulations say products using phthalates do not have to mention their presence or carry a warning on the packaging. Only containers with more than 0.5 per cent of dbp, bbp and dehp have to be labelled with the skull and crossbones symbol for the purpose of handling, according to the Phthalates Information Centre Europe, an industry body. The EU also has a rapid alert system for non-food consumer products, under which member nations can access information about steps being taken by other member states and economic operators with regard to products posing a serious, long-term risk to health and safety of consumers. The US Congress enacted the Consumer Product Safety Improvement Act (cpsia) in August 2008, prescribing restrictions broadly similar to those in the EU on toys and childcare articles sold in US markets. The ban on dinp, didp and dnop is interim. The Act stipulates two types of restrictions on phthalates. The first part of the regulation, which came into force last February, permanently bans manufacturing for sale, distribution and importing of children’s toys and childcare articles containing more than 0. 1 per cent of either dehp, dbp or bbp. A toy is a product meant for a child of up to 12 years, while a childcare article refers to a product that a child of three years or younger uses for feeding, sleeping, sucking and teething. The second part of the regulation seeks an interim ban on dinp, didp and dnop (above 0.1 per cent) from being used in childcare articles or toys that can be placed in a child’s mouth. By definition a toy or part of a toy can be placed in a child’s mouth if in one dimension it is smaller than five centimetres. Toys that can only be licked are not covered under the regulation. The threshold levels are prescribed only for individual chemicals; no composite threshold is prescribed for more than one phthalate present in toys. The Act does not mandate labelling toys to indicate compliance with phthalate standards. A seven-member Chronic Hazard Advisory Panel of scientists established under cpsia will look at health effects of the full range of phthalates, individually and in combination, used in children’s products. The panel has 18 months to complete its study. After this the Consumer Product Safety Commission, tasked with implementing the Act, will evaluate the findings and consider banning products containing phthalates as hazardous. The commission has devised detailed testing methods to identify the presence of phthalates. Under these methods the manufacturer is required to provide a certificate testifying its products have been tested for compliance with the commission’s guidelines. Since September 2009 the testing is specified to be done by an accredited third party laboratory. But the commission has stayed general certification until a panel of accredited labs is established. So the law is yet to be implemented effectively. The Bureau of Indian Standards (bis) has issued three sets of standards covering safety aspects of toys but none covers phthalates. These standards deal with safety aspects related to mechanical and physical properties and flammability and specify the maximum acceptable levels for eight metals in toys (see table: Indian standards for toys ). Even these standards are voluntary in nature. The bureau is revising these standards to align them with the international iso standards, a bis official said. The process began in June 2008 but has taken a backseat. 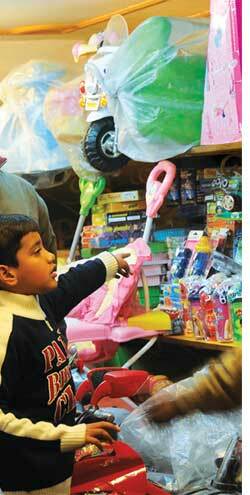 The agency is drafting standards covering the use of phthalates in toys. According to the Toy Industry Association, China follows international standards dealing with safety aspects of toys related to mechanical and physical properties. Phthalates are not covered under these standards.